A whole new game mode, thirty new cards for your collection, a brand-new board, and the chance to school some of the Scourge’s most infamous champions – all this and more awaits in Curse of Naxxramas! Curse of Naxxramas is a single-player PVE adventure integrated within Hearthstone. In Curse of Naxxramas, you face off against powerful bosses as you battle your way through the dread necropolis and its hordes of undead fiends. You will encounter villains such as the wily warlock Heigan the Unclean, the vile abomination Thaddius, and none other than the master of Naxxramas himself, the lich Kel’Thuzad. It’ll be a challenge, but if you outwit these fearsome foes you will reap the awesome rewards of the undead stronghold. Curse of Naxxramas consists of five wings which will be released one at a time, and one per week, during the initial release of the Naxxramas adventure. For those of you keeping score, those wings are: the Arachnid Quarter; the Plague Quarter; the Military Quarter; the Construct Quarter; and Frostwyrm Lair. Each wing is inhabited by a number of bosses. You don’t have to complete these wings in any particular order, but you do have to defeat each wing’s bosses in sequence. Now, the big question is, why go through the trouble of fighting all these incredibly powerful enemies? The answer is simple: Cards. Sweet, sweet cards for your collection. When you defeat a boss, you add two copies of a brand-new neutral card to your collection. 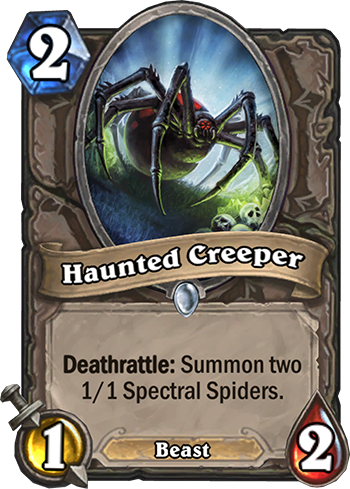 For example, upon sending Anub’Rekhan skittering back to whatever dark and dusty corner he crawled out of, you get a pair of his Haunted Creeper cards. But wait, it gets better: when you clear a wing, you unlock a new legendary card! And on top of that, you can also earn new class cards by completing class challenges. To unlock a class challenge, you need to defeat the boss associated with that challenge. 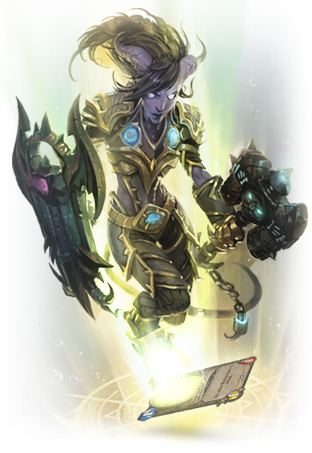 For example, Grand Widow Faerlina in the Arachnid Quarter guards the Druid class challenge; if you defeat her, you can now try your hand at that challenge. In order to complete a class challenge, you will have to defeat the associated boss using a custom, pre-set deck designed to test your skill with the class in question. Good luck! Aside from 30 new cards, over a dozen new boss fights with unique mechanics, a brand new game board, and a smattering of fun class challenges, Curse of Naxxramas has one more ace up its sleeve: Heroic Mode, which you unlock when you clear a wing of Naxxramas for the first time. Heroic Mode is designed exclusively for players that are avidly seeking a challenge worthy of their skills at the hands of almost comically overpowered opponents. If you’re looking for a fair fight, you’ve come to the wrong Necropolis! Steel yourself and bring your best decks, along with a healthy heaping of patience. You’ll need it!